Denver is known for its unique blend of bustling city life and gorgeous nature scenes, but you don’t have to travel outwards from the city in order to enjoy a little greenery. Washington Park or “Wash Park,” as the locals call it, sits just minutes from the busy streets of the downtown area. Complete with two lakes, tree-lined walking paths, and perfectly manicured landscaping, this area provides an oasis for those who live in the city. This is where “Denverites” come to walk their dogs, paddle boat, or just get away from their hectic schedules and enjoy the peace and quiet Wash Park offers. Bordering the neighborhoods of both Washington and Platt Park, those who call The Henry apartments their home have instant access to this refuge any time of the year. If you’re planning your first visit, then this is everything Wash Park has to offer. Blending seamlessly into the Wash Park neighborhood’s tree filled landscape, the park itself covers an expansive twenty-five blocks in the middle of an otherwise suburban-oriented area. After driving through the enormous evergreens that denote its northern entrance, parking can be found off to the right by the Volunteers for Outdoor Colorado building. This non-profit organization not only maintains the park, but has been actively protecting Colorado’s ecosystems since 1984. If you enjoy the outdoors as much as you do making a difference, then their incredible list of ongoing projects is worth a look. They also feature projects specifically designed for youth and business groups in the area. Further down lies additional parking next to Wheel Fun Rentals, where you can rent everything from kayaks to quad bikes and surreys as you explore every acre of Wash Park. LED illuminated night rides, ice cream, and Big Brothers Big Sisters opportunities are also available. Next to Wheel Fun Rentals sits Big Garden, an expanse that features paved walking trails surrounding a multitude of greenery all kept pristine by the Volunteers for Outdoor Colorado. This is the larger of the two gardens in the park, which combined feature over 54 flower beds with nearly 15,000 species. 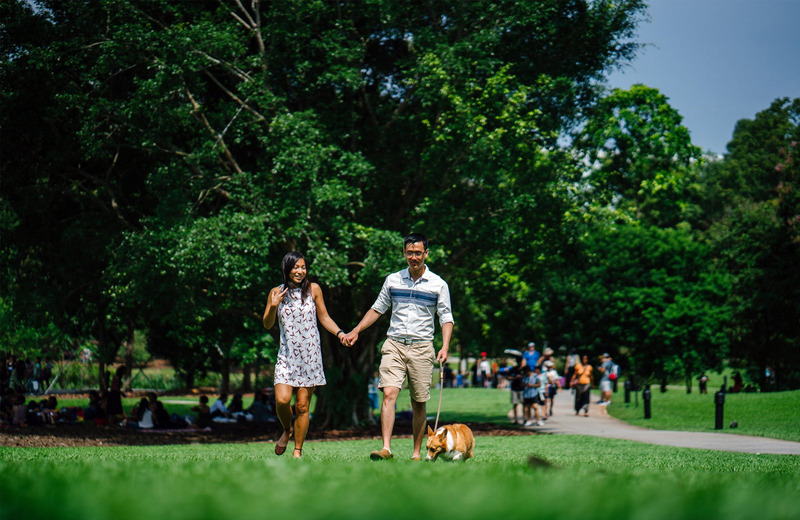 The southern half of the park is home to an expansive green field, tennis and basketball courts, shaded picnic areas, and an enormous fenced in dog park called The Lawn. The trail loops around Grasmere Lake on all sides, providing ample space to bike or walk. As you loop up past the other side of the field, you’ll pass the park’s maintenance building on your wat to both the Wash Park Recreation Center and Boathouse. The rec center offers all sorts of activities for Denverites to take part in. You could swim laps in their indoor pool, work up a sweat in their fitness center, or challenge your friends to a variety of sports. The boathouse, as you might have guessed, provides a variety of boats that you can take out on Smith Lake. Fishing is permitted within the park, so long as you have a Colorado State license to do so. This is also where you’ll find the smaller of the two playgrounds located within the park. It features plenty of fun structured for your little ones to climb around like monkeys and make new friends. The second park is located down by the picnic areas. The trail finishes its loop around Smith Lake, passing by Lilly Pond before coming to back full circle to the northern entrance. There’s plenty to do within the park itself during the day, but Wash Park is known for a lot more than just this wonderfully green oasis. Wash Park is a diverse neighborhood, combining the best of both historic and modern Denver into one vibrant location. For instance, South Pearl Street was once home to the city’s first trolley car. Just a block over, however, you can find the craft beer microbreweries that have made Denver such a hotspot in recent years. Out of all the fine dining and unique drink experiences available is the area, there are a few key locations that stand out amongst the rest and give the neighborhood its unique feel. The Denver Folklore Center is one of those hot spots, boasting a legacy of renowned acoustic instruments played by the likes of Bob Dylan, Muddy Waters, and Judy Collins. Their lineup features everything from well-known string instruments to the rare and exotic, including some of the finest woodwork in the country. Old South Gaylord, on the other hand, stands as more of a cultural destination. This area is brimming with premier shopping and fine dining destinations that make their storefronts in late 19th century buildings. There are seemingly endless opportunities within the tree-lined streets of Wash Park, but many locals head here for the festivals as well. Summer gives way to music festivals and farmers markets, while winter holds a few of its own surprises throughout the year. Fall, however, remains the liveliest time in Wash Park. HarvestFest and Blues and Brews take over August with seasonal beers that pair perfectly with the year’s harvest. Oktoberfest is also celebrated across the neighborhood, giving way to drinks and entertainment centered around Germanic culture. Any way you slice it, Washington Park is an excellent place to visit in Denver. You can find something to do around nearly every corner or just relax and take in the scenery at the park. Standing seven stories tall and sitting on 4.29 acres of premier residential property, The Henry apartments are minutes away from Wash Park in neighboring Platt Park. Residents who make their homes here enjoy 45,000 square feet of common space filled to the brim with amenities that suit any lifestyle. Easy access to the light rail provides fast, reliable transportation to work and Wash Park, but having a unique home to come back to is what makes living in Denver so special. Every inch of these home’s interiors has been thoughtfully crafted to suit the modern appeal of Pratt Park while elevating your sense of high-end living. We invite you to explore the possibilities that living in Denver has to offer here at The Henry. Welcome to a better life in the city.